Let Cozi remember your to dos, so you don’t have to. 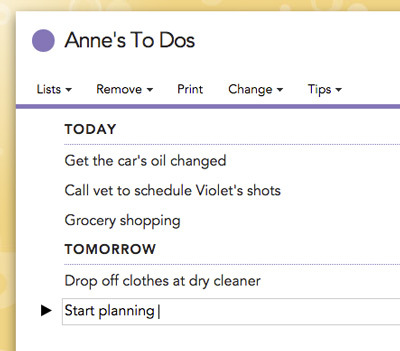 Your family can add and manage to do list items from any computer or mobile device. To add an item, select a list, type an item, and then press Enter. To create categories within a list, type the category header using all capital letters. 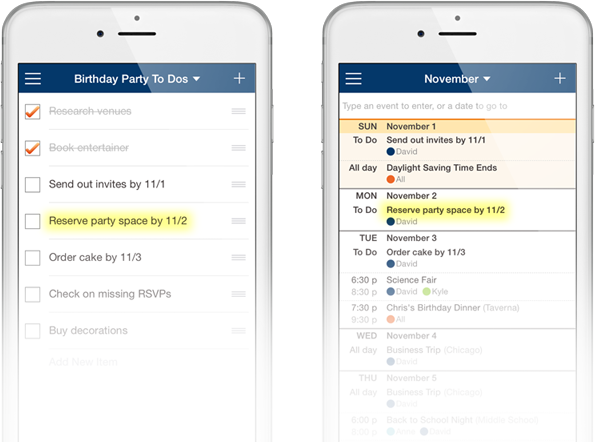 For example, if you would like to organize your to do list by short-term and long-term tasks, you could add categories like TODAY or THIS WEEK. To move items within a list, drag the item you want to move, and drop it where you want it to be displayed. On the web, drag with cursor; in the apps, press the three horizontal lines to the right of the item. To check items off a list, click the box to the left of the item. You’ll see a check mark appear next to the item, as well as a line running through the item. To remove items from a list on the web, check off the items and use the Remove menu at the top of the page. 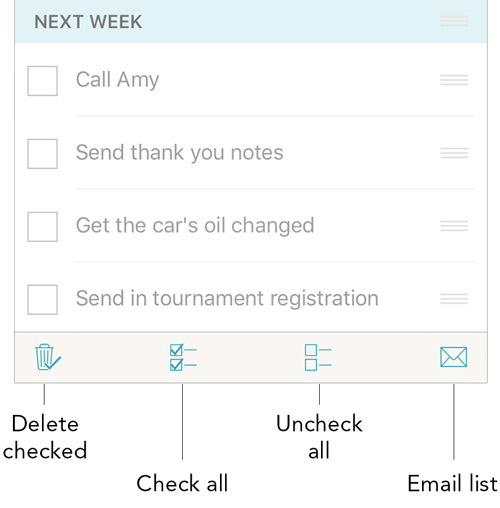 To remove list items in the apps, check off the items and use the action buttons at the bottom of the screen. NOTE: If you use the Check All Items option, then Delete All, any included headers will also be deleted. To add a due date to a list item, add a date (Month/Day; for November 22 enter 11/22) to the task and it will automatically show up in your calendar. Lists can have a single owner or be listed as “Shared” if they’re being used by multiple people. Click Change at the top of your list, click Assign list to, and select the household member who will be the owner of the list. Select Shared list if you want to keep the list unassigned. Click Change, then Organize To Do lists, then use your cursor to drag and drop lists into the desired order. From this screen, you can also assign individual lists. To create a new list, click Lists at the top of the To Do page, then click New List. 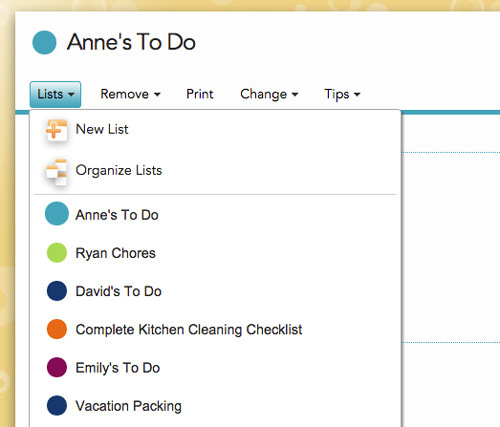 To rename a list, click the list’s name at the top of the page (say, “Ryan’s Chores”), and type a new name. To select a different list, click Lists at the top of the page, then click the name of the list you want to view. To change the order lists appear, click Change at the top of the list, then Organize To Do Lists. On the Organize your lists page, drag a list and drop it in the desired order. The first list will appear on your homepage. To delete an entire list, click Remove at the top of the list, and then click Permanently delete this list. To create a new list in the To Do section, tap the + on the top right of the screen. To rename a list, tap the list’s name at the top of the page, then go to Organize Lists. Select the list you’d like to rename, then change the name and save. 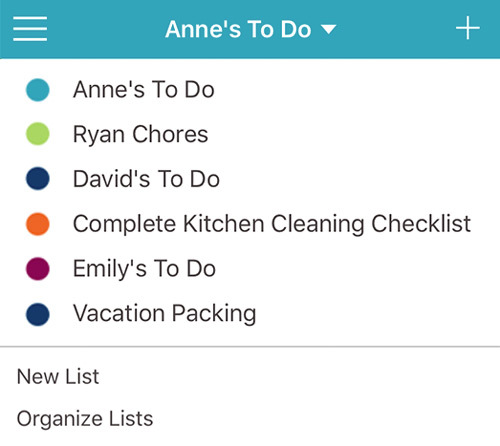 To change the order lists appear, tap the list’s name at the top of the page, then go to Organize Lists. Drag a list and drop it in the desired order. The first list will appear on your homepage. To delete an entire list, tap the list’s name at the top of the page, then go to Organize Lists. Select the list you’d like to delete, then choose “Delete this list”.